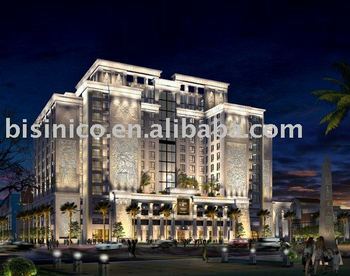 Professional 3D exterior design of a luxury hotel.3D model design. Matching materials(decoration items) are also available. Thepicture in this page is the 3D design picture about the outsidearchitect of a luxurious hotel in China,from one of our formerprojects. The style of this picture is contemporary style,which includes a lot of contemporary elements and related decorational details. Different kinds of design styles are available.Such as American style,European style,modern style,French style,etc. Can also design based on your own requirements or the specific design styles you want. Besidesdesign service,we could also arrange and offer you the completematerials necessary for the project,which offers you a fullproject solution andone stop materials market.From A to Z.